Power panels replace #6 drawers and attach to the front of the cabinet with four screws. 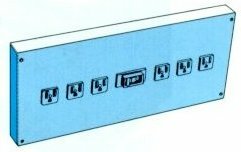 Power strips are available in 48" or 60" models. They can be mounted to the workbench for convenient additional outlets.